How to Grouping List Items (option) in ASP.NET DropDownList control using Jquery. In this post, I am explaining how to Grouping List Items (option) in ASP.NET DropDownList control. 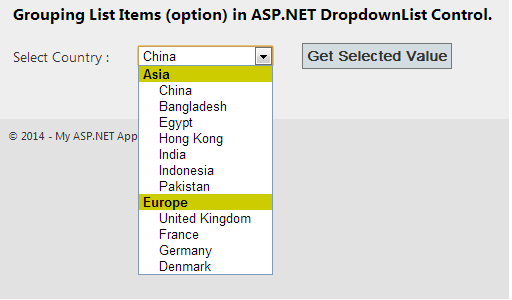 ASP.NET DropDownList control does not allow Items grouping feature. Here in this post I have explained how we can do this very easily with just a few jquery lines. Bind dropdownlist from database data in ASP.NET Using Jquery. Grouping Items in DropDownList Control. Get dropdown selected value from Code behind. Retain dropdownlist selected value after postback. Step-3: Create a table for fetch data from Jquery function. Step-5: Add a Webpage and Design for bind database data to dropdown list. Step-6: Write this function into your page code behind. Must have to do this EnableEventValidation="false" into your page. Step-7: Write this code into button_click event for get selected value from code behind.